these luxury apartments with one, two or three bedrooms, large terrace and breathtaking views are just 1 minute walk from the beach. The quality construction of this complex, luxurious living room complete with every imaginable amenity, private garage, shed and swimming pools we can safely describe as 'luxury in every detail'. Built on the ideal spot for a second home. At the heart of the area without doubt the most pleasant climate of Europe. 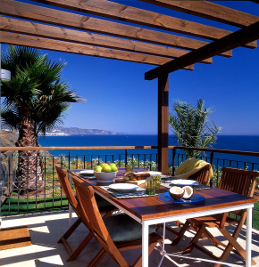 A few minutes drive from the stretched promenade of Torrox Costa and the charming old shopping streets and restaurants of the picturesque resort Nerja. These apartments are not only ideal for winter or holiday destination but also have excellent rental potential. Experience these quality apartments and the ambience of the environment for a long weekend, week or month. Please click on this link for sales information or contact us by email for more information if you wish to 'try before you buy'.